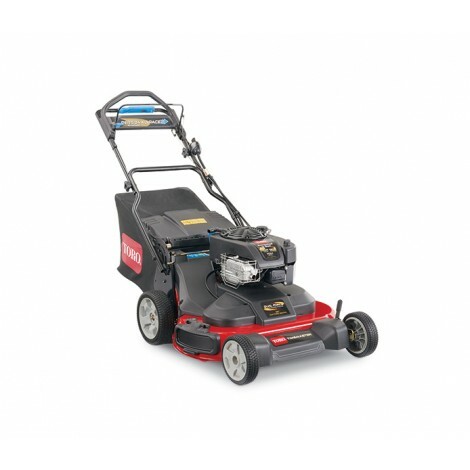 10.00 ft-lb Gross Torque Briggs & Stratton® OHV- Powerful 10.00 ft.-lb gross torque Briggs & Stratton OHV engine delivers the performance and durability that Toro is known for. Electric Start- No need to pull the cord, just turn the key and you're ready to mow. Dual-Force Cut- The Dual-Force™ twin blade cutting system and Toro Atomic blades cut grass into a super fine mulch for superior quality of cut and a healthy, rich lawn. Personal Pace® Self-Propel System with Traction-Assist Handle- This intuitive technology automatically adjusts the mower’s pace to your walking speed. For more challenging areas with uneven terrain, the Traction-Assist" Handle can help monitor your speed, and keep you mowing at a comfortable pace. Blade Stop System- Lets you start it once, then keep it running. Now you have the freedom to step away from the mower to move an obstacle or empty the grass bag without having to restart every time. Quick-Stow Lever- The TimeMaster has two storage positions for easy compact storage and convenient handle height positions to insure a comfortable mowing experience for any operator. 2 Point Height-of-Cut- You can easily adjust the deck height at 2 points instead of the hassle of walking around the mower to adjust 4 different levers. Washout Port- Attach a hose to the mower deck to easily clean the under side of the deck. 3-Year Full Warranty- Expect the best - and get the best. Industry leading three-year full warranty means if anything goes wrong for three years under normal use and maintenance, Toro will fix it free. See retailer for warranty details.